The John Pennekamp Coral Reef State Park, America's first underwater preserve, celebrates its 50th birthday this December. The 11 day celebration from, 1st to 11th December, is a milestone birthday and will offer divers, snorkelers and other visitors the chance to discover the nature trails, beaches and abundant underwater life that inhabit this spectacular 70 mile stretch of Key Largo. The park was originally dedicated to the late Miami Herald editor, John Pennekamp, in 1960 and today this 'jewel' of the Florida Keys, which is just 90 minutes from Miami, sees more than one million visitors a year. This 50th anniversary brings into the spotlight the history of the park and its mission to protect and preserve the nature within its boundaries, particularly a portion of America's only living coral barrier reef. 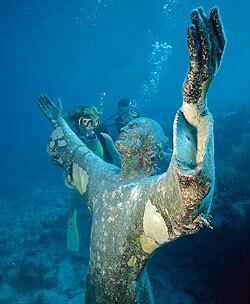 The festivities will include an underwater celebration at one of the parks most famous offshore attractions, a nine-foot bronze 'Christ of the Deep, donated by the Underwater Society of America in 1961. There will be water and land based events for the whole family, including a planned world-record snorkel attempt, educational and conservational activities, glass-bottom boat excursions to view the reef, canoeing, kayaking and fishing, as well as time to discover the surrounding nature trails and beaches.